Abdullah Abdullah, the front-runner in the Afghan elections, has acquired powerful endorsements ahead of the run-off. Over the weekend, Afghanistan’s front-runner presidential candidate, Abdullah Abdullah, received a major endorsement from his former rival Zalmai Rassoul. Rassoul placed a distant third in the elections that took place in Afghanistan on April 5, 2014, with only 11.5 percent of the vote, while Abdullah secured nearly 45 percent of the electorate and runner-up Ashraf Ghani received 31.5 percent. Ghani and Abdullah are slated to participate in a run-off election, slated to take place on June 7, 2014, that will determine which one of them emerges as Afghanistan’s next president. Rassoul’s endorsement will be an important factor in determining the outcome of this election, partly due to the sway he holds with Pashtun voters and his perceived closeness to the incumbent Hamid Karzai government. It would be oversimplification, of course, to project that with Rassoul’s endorsement Abdullah will easily take the prize. Abdullah’s plurality margin was about 900,000 votes while Rassoul received 759,000 votes in total. The endorsement by Rassoul, an ethnic Pashtun, will likely manage to draw some Pashtun voters over to Abdullah; however, many might still vote for Ghani, who is himself a Pashtun. Abdullah is of mixed parentage, being half Tajik and half Pashtun. Part of why Abdullah’s status as front-runner is historic is because Afghanistan has not had a non-Pashtun leader in modern times. Abdullah’s election would change that. For the moment, Rassoul’s endorsement will galvanize Abdullah’s position ahead of the run-off. However, even if every Afghan who voted for Rassoul votes for Abdullah in the run-off vote, and Abdullah does not lose any voters who voted for him in the initial round, he still would not have the requisite votes to surpass the 50 percent mark. This is where the endorsements of the other candidates come in. Overwhelmingly, with the exception of Abdullah, all of the serious candidates for president in these Afghan elections are ethnic Pashtuns. Here the support of men like Gul Agha Sherzai, who drew just over 100,000 votes in the preliminary results, proves useful for Abdullah. Sherzai, who has a strong support base in the Pashtun-dominated southern province of Kandahar, has formally come out in favor of Abdullah. Sherzai, along with Rassoul, both cited national unity as a factor driving them to ultimately pledge support to Abdullah (in addition to possible deals for powerful positions within an Abdullah government, although this is speculation). A spokesman for Sherzai alluded to the notion of a north-south split in Afghan politics should Abdullah, widely perceived as exclusively a Tajik despite his mixed parentage, emerge as president. According to Rassoul and Sherzai, their backing will credibly demonstrate that Afghanistan’s Pashtuns can be led by a Tajik without any sort of national calamity. While Abdullah appears to be in a powerful position ahead of the run-off, his position might change due to other factors such as voter turnout. 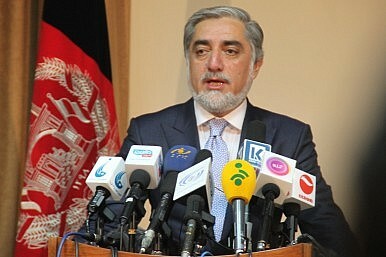 Abdullah benefited from the euphoric mood ahead of the initial April 5 elections, which drew a huge turnout. As the Taliban begins its “Spring Offensive,” security concerns around voting will rise and Ghani could inch ahead due to how many voters turn out in reality to vote. Security concerns have led some to argue that in the name of national unity and stability, Ghani ought to forge a deal with Abdullah and avoid a run-off vote. Ghani, however, remains determined. He believes that he still has a strong chance at winning this election. While Rassoul and Sherzai’s endorsements strengthen Abdullah considerably, Ghani believes that those individual’s endorsements are not motivated by popular support of any sort. Afghanistan's election results aren't out yet but we know who certainly lost the election: the Taliban.